No one enjoys the process of boxing up all of their belongings and finding a new place to settle down. Relocating can be even worse when you love the home you are leaving behind. The good news is that it is possible to pack up your suitcase and include the kitchen sink, while it is still attached to the house. 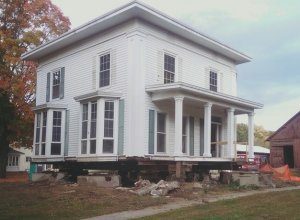 Depending on your circumstances and budget, house lifting can be the perfect option for your next move. To better understand if lifting your house from its foundation and moving it from one location to another is the right choice for you, check your governmental policies and find experienced professionals who specialize in home removal. These experts will be able to guide you through the process, making sure it is a wise and achievable route for you to take. A good company will also have insurance to cover damage during a move, so look for a business willing to stand by the work they perform. Regardless of the stage of planning, there are other important factors to take into account. One of the main considerations is budget and time. House lifting is expensive and can take days or weeks to complete, so the cost and logistics need to work with your specific situation. Secondly, reflect on the personal reasons you want to keep your home and compare them with its age, structural integrity and potential value. You may find that the building will not survive the moving process and require more money to restore it. However, it can sometimes be less expensive to move your house than to build from the ground up and permits are generally not necessary. Whether saving a historical treasure or adding value to a residence by moving to a better area, there are multiple reasons that house lifting could be the ideal option for you. With the proper information and professional help, you can put your beloved home in your dream location and never move again.